Welcome to the Old Car Spares, Suppliers and Services Website. This site has been set up using the Austin Seven Red Cross Spares and Services Directory that was created to aid Austin Seven owners in the restoration and maintenance of their vehicles, but welcomes recommendations from all pre-war car owners and those with post-war ‘classics’. The object is to be able to keep our cars running by passing on useful sources of suppliers and service providers. This way we all help each other. Please visit the Contact us/Updates page to advise us of other contacts who are a source of supply or have given good service that can be recommended to other owners. If you spot any details on any of the entries on the site that need to be changed, or updated please let us know via the Updates page. PLEASE NOTE: ONLY THE WEBSITE ADMINISTRATOR CAN MAKE CHANGES TO THE PAGES. NOTE: All enquiries for spare parts, services etc., should be made via those listed on this website. Whilst we are always pleased to help point you in the right direction for specific items we do not ourselves hold or sell spares. You are welcome to use the comments facility to seek or sell parts. We recommend that you go to the correct section to add your comment rather than just place it on this Welcome page, such as Austin Seven Specialists section for Austin Seven spares and services, or in the Spares and Services Directory click on the title on the right and select the correct category from the list. That way you will get directly to the best source for your request. Please be aware that all comments will be automatically submitted to Administration for approval before being published. Comments will be removed after 30 days, or earlier by request. 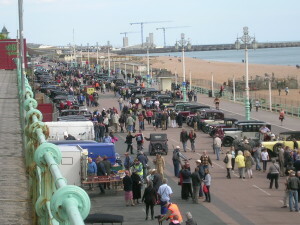 Over 300 mostly pre-war Austins were entered for this run from Woodcote Green Garden Centre in Surrey via Tulleys Farm near Turners Hill for a mid way refreshment stop to Madeira Drive, Brighton. The Austin Seven Owners’ Club commissioned a DVD of the run and these are now available to order.